Australian Big Cats: Does Broulee have a black panther? Does Broulee have a black panther? A man claims to have seen a "panther" like animal, fair enough. The newspaper(aprils fools day gag?) 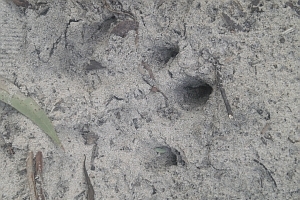 shows a print of a wallaby print with the feet landing right next to each other..
You can see the ridge of sand running down the middle. Mogo zoo doesnt recognise it and then for(aprils fools days gag) they ask Tim Bull. "ACT-based cryptonaturalist Tim the Yowie Man was in agreeance." Seriously...What sort of journalist uses the "word" agreeance..
His name is Tim Bull. Why anyone with an IQ higher than a fruit bat would assume people would find you more credible by pretending you have a wacky fake surname is beyond me. “Due to the claw marks it is extremely unlikely to be a big cat, which is unfortunate, because I would like there to be one down there,” he said. 1/Tim Bull would not know the difference between an elephant footprint and a mouse print. 2/Sometimes, cats do leave claw marks, mud etc. 3/Why, other than an aprils fools day gag, are they asking Tim Bull a question.? 1/Tim Bull has seen a "black panther"or he claims he had.Its in his booklet. Though the last time he was on tv..he claimed there was only a tiny % of a chance that they exist. Yes I know that does not make sense..
3/Tim would not have the slightest idea if there is any form of evidence related to felids in Australia. I hope the whole lot was an april fool day gag..